The chronology at the beginning of this book summarizes how Steiner gave his April 23, 1919 lecture to workers at the Waldorf-Astoria Company (a cigarette factory) and notes that after the lecture (contained in this book) the workers petitioned for Steiner to be made a member of the cabinet. [page xxvii] According to Carl Unger, the resolution was misunderstood, because people thought Steiner wanted to join the present government, something he did not consider, since, in his opinion, if he was called by the government, his first act would be to dissolve the government in its present form. This quotation makes an apt beginning for my review of this book because so much of it deals with the threefold social order, i. e., an independent culture, an independent social economy, and an independent government. These are three cornerstones of Steiner's Threefold Social Order (page 206) and notice the careful use of "independent" in all three places. Obviously Steiner did not envision a government that would be coercive over either the culture or the economy or else there would be no independence and you would be left with a one-legged stool that would fall over of its own weight. That "government" he would have dissolved was a coercive state. Alan Turing designed a test to determine whether we had created artificial intelligence or not. It is very simple: you communicate via email with another person and by their responses you decide whether they're a person or a computer. If you choose "person" and it's really a computer, then we've achieved artificial intelligence. Simple concept, but very deep in its implications. A computer program named Eliza appeared in the 1970's that simulated a session with a psychoanalyst. The first time you used it, you were amazed at the responses — they seemed to be coming from a real analyst. Soon, the technique for generating responses became transparent and you realized it was a machine you were talking to and your interest drained away. [page 8] What makes machines so devastating for people is their spiritual transparency: all the forces and interactions in machines are so clear and transparent to the human mind. Mechanical clarity draws life out of the human heart and soul, makes people dry and inhuman. 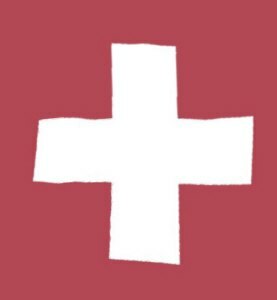 [page 9] A powerful modern political party calls itself the Social Democrats, thus welding socialism and democracy together, although they are the opposites of each other. They were welded together, but the spiritual was left out because socialism relates only to the economic realm and democracy relates only to the rights realm, the spiritual relates to individualism. The key to fostering these three independent realms lies in the way we rear our children. During the first period of life they should be encouraged to be imitative. "People become free only if they were intensely imitative as children." (Page 11) From age seven on, if they have an adult to look up to as an authority during the time preceding puberty, they will develop the capacity to respect the rights of others as an adult. [See Review in ARJ: Karmic Relationships, Volume 8.] From puberty to adulthood, the period from fourteen to twenty-one, the emphasis on love, particularly the love for all of humanity, is of prime importance in the young adult's education. If we attend to these three things in our children's education at the appropriate times, we foster an adult in which the foundations of a threefold society are woven together. [page 14] These things are completely interwoven, and thus I must say: imitation in the proper manner develops freedom; authority, justice; and fraternity or love, economic life. What Steiner calls economic life, socialism in economic life, that is, I think can be found in the results one would expect from implementation of Galambos' technology [See Review in ARJ: Sic Itur Ad Astra .] by individuals in the form of a Natural Republic. One person will cooperate with another person in freedom, justly, and out of love. When they refuse to cooperate or renege on a voluntary agreement (defect), the restitution that they will make voluntarily will cost them more than they gained by the defect, so that defects will be damped out of existence over time. When small crimes are corrected in this way, large crimes will not occur. To be culturally free means that one will learn to express as coming from oneself only those ideas that arise in freedom within oneself, and one will acknowledge the source of all others ideas in gratitude and cooperation, freely and without the force of artificial law. There will be no need to enforce royalty laws, copyright laws, patent laws, which in the current milieu have enormous, expensive, and hard-to-fill loopholes. [page 44] In modern times we suffer because on the one hand we have economic life, a practice without ideas, and on the other we have only social democratic theories with no possibility of practice. [page 51] Many people believe the idea of the threefold social organism would stand the world on its head. Perish the thought! The world is already standing on its head, and the threefold social organism would only put it back on its feet. [page 51] People will learn how Imagination is connected to commodities only if economic life is clearly defined, and we recognize the need to administer economic life with fraternity. What Inspiration means for labor — that it calls forth a desire and love for work — will exist in the world only when Inspiration permeates the concept of equality in parliaments so that equality truly prevails and individuals can validate what lies within themselves. However, that will be quite different for each person. Then, equality will prevail in the rights realm. Laws will be Inspired and not passed in the mundane fashion increasingly common to democracy. In a Natural Republic those that cooperate with each other will prosper and those that defect (interfere with another's property) will voluntarily pay restitution. In this way everyone's economic life will be administered with fraternity. There will be no parliaments or congress because there will be no state mechanisms, and thus there will be no artificial designation by the state of privileges and disbursements that abridge equality. With no State, there will be no laws "passed in the mundane fashion" Steiner refers to. Every person will operate with 100% control of their own life, thoughts and ideas, and personal property, and thus equality will prevail in the rights realm. Will this be easy? No way! It will require a turning about of the ideas that people currently hold precious, and that is equally true of anthroposophists that I have known. Somehow they view Steiner's threefold social order as a call for State control which we already have or for some idealized utopia which we will never have. [page 53] People have such difficulty getting used to new ideas because they love their old heads so much, those old heads so accustomed to thinking the way people have thought for so long. [page 46] "We are wise and, of course, we know that it is only a picture. We are above such pictures." What they do not comprehend is that children become really engrossed in the picture only when you believe it yourself. This clearly illustrates that what you are speaks more loudly than your words. That the real effect of a living teacher present before one is that the student receives via direct transmission of learning through a live channel information that cannot be recorded in books, on audio tape, or video tape. From the picture placed before us by our God-sent teachers, we can learn, if we but become engrossed in them. If the picture is sent directly from God through divine forces, we do best to pay close attention to it in freedom and light. [page 47] The picture of the butterfly emerging from the cocoon is, in truth, a picture of the immortality of the soul, placed into nature by divine forces. There would not be a butterfly emerging from a cocoon if there were no immortal soul. . . . We can understand nature only when we know it is a picture of something else. I am what you see when you look at me after a long absence. I am with almost no physical correspondence. I am my I am! It is the great charge of teachers to be able to see beyond the porcelain doll of the physical body to the I of each of their students. What teachers need are tools to bring out the individuality of each student and tools to remove the rough edges from each student's individual upbringing. In that "foreign country of the past" human beings had a different intelligence than we do now. Children come from that foreign country and only gradually over the first twenty-one years of life do they immigrate to our country. [page 73] To understand the meaning of what modern people call intelligence, we must ask how people in earlier developmental stages viewed intelligence, and how that intelligence slowly changed into the form we find in our times. As late as Plato's time, people said, "If I only think, I can only comprehend what is dead." (Page 75) Where we are headed now is down a path of "errors and illusions that will lead us to think only of evil things." (Page 76) This observation that Steiner made 80 years ago anticipates very well the content of the average evening TV news program, which, when there's an occasional respite from bad news for that day, is filled with talk about upcoming possibilities for bad news. It is becoming ever more difficult to recognize good with merely our intellect, ever more difficult "to look towards the light of what is good." (Page 76) That's the way it is, up until now. With the help of Archangel Michael and the teachers on Earth from his supersensible school during this Age of Michael, we can expect to begin to make progress in freedom and light from now on. [page 85] Today, tumorous growths occur in some people because a portion of their body tends to become like the entire body of the Egypto-Chaldean. In the newspaper this morning was an article announcing that doctors have discovered that "tumors make blood vessels." Doctors had always assumed that the cancer was of the same kind of tissue as the rest of the body and that a tumor made do with the blood supply already in place. Using this insight of Steiner's they could have predicted that inside of tumors they would find the growth of conduits for blood supply because of the inherent plant nature of the tumorous growth. This discovery will lead to new therapies which attempt to stem the blood flow and block the growth of new blood vessels to tumors. A new gene study identified two genes involved with angiogenesis (blood vessel formation) but not required in adult development. By deleting these two genes from mice, they were able to produce cancer-resistant mice. [page 88] During the First post-Atlantean period, the I had a deep effect. In the Second post-Atlantean period, the astral body had a deep effect. In the Third post-Atlantean period, the etheric body had a deep, but at least bearable, effect, one that brought people into a relationship with all creation, as I mentioned yesterday. Now, we can say "I" and all sorts of things, but they no longer have an effect upon us because we comprehend the world through our corpse, that is, we comprehend the dead, the mineral part of the world. Our chore for this Fifth post-Atlantean period is clearly "to move away from dead, abstract concepts into living, concrete concepts" (page 89) such as Goethe did for us in his essay, The Metamorphosis of Plants. [page 89, 90] Consider for a moment how a person's religious world view often runs, disconnected, alongside his or her scientific world view. Many people have the one and the other but build no bridges between them. They often have a kind of fear or anxiety about creating these bridges, but we must be quite conscious that things can remain so no longer. My thought is that we should not build a bridge, but build a channel to join the two streams of religion and science into one living stream of reality. There is a beautiful story in Antoine St. Exupery's book Citadelle (in English, Wisdom of the Sands) on page 18 and 19. He tells how some dolt questions the customs of his father's estate and says, "Why not change some of them?" The victims of his charade fall to dismantling the house in revolt. Soon every evidence of the house and the old master is gone. [page 19] On the ruins of the palace they have laid out a public square; but once the pleasure of trampling its stones with upstart arrogance has lost its zest, they begin to wonder what they are doing here, on this noisy fairground. And now, lo and behold, they fall to picturing, dimly as yet, a great house with a thousand doors, with curtains that billow on your shoulders and slumbrous anterooms. Perchance they dream even of a secret room, whose secrecy pervades the whole vast dwelling. Thus, though they know it not, they are pining for my father's palace where every footstep had a meaning. [page 91] What they mean is an Angel, their own Angel, which they call God! Nothing more! People still have a vague feeling that they have their own guardian spirit, which they look up to and call God. Even when they do not call it an Angel, but God, they still only mean an Angel. When we move beyond egotistic considerations which lead us to our Guardian Angel, we become capable of comprehending something higher, namely an Archangel. If we now meditate on the above Table of the seven epochs and ponder the evolution of consciousness through the various epochs, how our ideas of law originated with the Romans, our ideas of beauty with the Greeks, our ideas of how to use plants with the Egyptians, we can develop an attitude of soul that will lead us to understanding the Time Spirits or Archai. This next quotation of Steiner's hit close to home with me as I have received similar letters from distant relatives who are devout Christians and presume that my reading Steiner's works has somehow tainted me as a Christian, and they would dearly like to save me from my folly. [page 98] I've received many, many letters during my life, often from members of various churches who say that although Anthroposophy is very nice, it contradicts the simple, Christian belief that Christ saved human souls and that through Him we can receive eternal salvation with no activity on the part of our souls. They cannot let go of the "simple belief in salvation through Christ." People believe that when they say or write such things, they are particularly pious. However, they are simply egotistical. They are selfish right down to the very foundations of their souls. They desire to do nothing in their souls and to let Divinity take care of them so that their souls receive a wonderful pension on the other side of the pearly gates. It is not so easy in that world view that requires us to create a new idea of religion. People must realize that they have to work to understand the Divine in their souls. They cannot just passively subjugate themselves to churches that promise to take care of their souls. The second half of this book consists of the three lectures at the Waldorf-Astoria cigarette factory that began the Waldorf schools. The remainder of this review will deal with the content of these lectures. In a devastating critique of the slogan of the proletarian revolution Jakob von Uexküll compares the result of its implementation with cancer in the human body. [page 127] We see the same illness [cancer] in human society when the proletarian slogan, "Liberty, Equality, and Fraternity" replaces the state-oriented slogan "Coercion, Inequality, and Subordination." Steiner doesn't think much of Uexküll's conclusions that coercion should replace liberty, inequality instead of equality, and subordination instead of fraternity. Certainly the lessons of the French Revolution showed us that the indiscriminate implementation of that slogan would lead to destruction of the society. In a comment about another author, Steiner takes him to task for calling anthroposophy "a muddled confusion" of facts about the life of the soul, humanity, and the cosmos. [page 130] However, this "muddled confusion," which makes possible the achievement of such mathematical clarity, perhaps even mathematical sobriety, is precisely what protects anthroposophical activity from those babbling mystics and foggy-minded Theosophy. priestly, political, and economic. We must work ourselves out of these three tyrannies which still operate in our lives today. Since a tyranny is nothing if not coercion, he is recommending that we must root out coercion wherever we find it in our lives. Here again, even though he lived before Galambos's time, Steiner speaks as strongly against coercion in his time as Galambos did in his time. On the subject of life-time learning Steiner tells us that when one is learning from life, it becomes a life-long task, a task that is not completed when one graduates from college, no matter how important and prestigious one's specialty is. [page 160] However, what is truly important is that people learn to learn, that they learn to learn so they can remain a student of life even when they become old, right until death. Today, people , even if they have graduated rom a college, generally stop learning after they reach their twenties. They can no longer learn from life. They only drone on and on about what they have learned until then; at best they occasionally add something. Those who are different are the exception today. It is important that we find a way to teach how to learn, that is, how to learn throughout life from life. Certainly Steiner will admit that some learning takes place in people's lives, but sometimes the learning requires prodding from life. 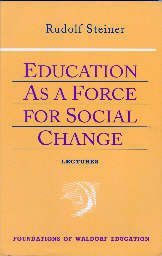 He would suggest that it is essential for modern times that everyone continue education as a life-long task, and notes that it mostly doesn't happen, up until now. [page 165] We have experienced that where life has forced people to learn, they have learned; but where their own motivation could have led people to learn, nothing happened, nothing at all. As Steiner was giving these Waldorf lectures in 1919, the conference in Versailles was meeting to determine the fate of Germany after the Great War. It's clear from reading Steiner's comments on the conference that he was certain that it would be a catastrophe for Germany and history proved him right. The most salient outcome of the Versailles conference was World War II. Steiner says that Germany in the middle of Europe is pressed in on one side by the nebulous mysticism from the East and on the other side by the naked materialism from the West. [page 180] We must watch the East and cultivate what we must do so it is not forced on us, in decades, not in centuries, because humanity will be forced to do what it does not do voluntarily. Matherne's Rule #28: The Soul Captain leads the willing and drags the unwilling. This rule reminds me that if I do not choose to do something I may be forced to do it. One never knows for sure ahead of time if this is a choice that one will be forced to do anyway if one chooses not to do it, but hindsight is always accurate. Thus this rule allows us to inspect after the fact those instances in when something happened to us that we did not choose, such as an illness, an accident, a coincidence that led us to do something. What did the fortuitous event accomplish in our life? Did it give us permission to do something that we would have never done otherwise? Or did it protect us from doing something that if we had done it, would have led us to some misfortune? These two categories of events, permission and protection, help us to investigate the event. We can do this by asking first the permission question, "What did I do because of the event that I would NOT have done otherwise?" And then by asking the protection question, "What did I NOT do because of the event that I would have otherwise done?" In both cases, the result will be discovered to have been a salubrious one, a desirable outcome. We may then apply Matherne's Rule #28 and thank our individual Soul Captain for the assist, and learn from life in the process to become more attentive to the nuances of our lives from now on. [page 183] Today, the call for free schools goes throughout the land, but what does this really mean? A call could go throughout the land for the creation of a society in which everyone could provide the proper support for education. Education free of cost is nothing more than a lie. Hiding behind this lie is either the fact that revenue finds its way into the pockets of a small clique so they can thus gain mastery over others, or that this is dust thrown in people's eyes to keep them from realizing that some of their money is taken to support the schools. I explained to Del at dinner one night that I'd pretty much reconstructed how I came to detest sauerkraut. [See ARJ: doyletics.com for information on tracing discussed here.] Mom cooked it once, and Dad yelled at her. He probably something elegant like, "What the hell are you cooking this crap for?" I was at the table, I had just eaten sauerkraut, and my gut tensed up to defend myself. A tensing up that actually mimicked the tension in my Dad's gut when he yelled. How I know that to be true is that shortly after I did the trace in the very beginning to remove the tone that Del didn't like, one that I used when I was upset, I was able to eat both liver and sauerkraut in short order, a couple of weeks. I heard Mom last week saying that she had only cooked sauerkraut for Dad once and he didn't like it. The tenseness that I used to defend myself, which is the same tenseness that was in my body whenever I formerly used to yell at Del in the tone she hated, got attached to the taste of the sauerkraut I'd just then put into my mouth. Ever after that I was unable to eat and enjoy the food, in fact, I avoided it entirely, until I did the trace to erase the tone [actually what I erased was the physical body state of the tension in my gut] That trace lowered the intensity setting on the tension in my abdomen. Without the sharp tension, the taste of sauerkraut no longer triggered anything unpleasant in my body and I was able to eat and enjoy it right off. Here's how I found out the sauerkraut doyle was gone: one morning I awoke from a dream in which I had been eating and enjoying sauerkraut. I ate sauerkraut for the first time that night and enjoyed it immensely. This is a good example of how one goes about recovering the full conceptual memory of an original event. Note the likelihood is that the tension was already stored as a doyle at the time of the sauerkraut incident. So doyles already stored can be stored with new triggers before five years old. I hypothesize that attitudes and prejudices like food dislikes are doylic in origin and they are transmitted from caregiver to child just as any other doyle may be. How is it possible that child can learn prejudices, bigotry, or race hatred from parents? [page 198] You may know the remark made by Jean Paul — that in the first three years of childhood we learn more about life from our nanny than we learn in three years in the university. The child acquires most of its emotions from its mother or nanny during those crucial three years. The substrate of the emotions are physical body states or doyles which are acquired when the child matches with the responses of its caregivers. In the next quote Steiner acknowledges the change in memory capability that occurs around the age of seven. [page 198] Children should be handled properly regarding memory. A child notices and remembers as much as necessary before the change of teeth. With the change of teeth, however, it becomes necessary to take the child's memory into consideration. It is important during that time that we do not overburden the memory — that we don't try to impress something onto the memory that falls out on its own. "Something that falls out on its own" is an intriguing phrase. My best guess as to what Steiner means is, that before seven, the primitive ability for conceptual or cognitive memory is such that abstract ideas and thoughts are not stored (thus, they "fall out"), but instead the frustrating feeling associated with trying unsuccessfully to store a cognitive thought is stored as a physical body state or doyle. Later as an adult, the attempt to perform a similar thinking function will trigger that same doyle of frustration and lessen the likelihood that the young adult will wish to do much of this frustrating thing called "thinking." Abstract thinking, like a dislike for broccoli, gets attached to an uncomfortable physical body state. If someone who dislikes broccoli will avoid eating it, someone who dislikes thinking will avoid it wherever possible. This analysis clarifies the reason that Steiner stresses that the alphabet and other abstract ideas and thoughts be saved until the first teeth change. My guess is that the period from 5 to 7 is a reasonable one to introduce the very beginnings of the alphabet and abstract thought in small doses as the cognitive memory capabilities of the child are just beginning. In this next quote we read Steiner's plan for his threefold social order and how education fits into it. [page 204] Thus, a basic principle of the Union for a Threefold Social Order is to work toward an independent school system, making it free of the state so that the state does not even inspect schools. The activity of self-administered schools should arise purely from cultural needs, and much can grow from that. Cultural needs are individual needs and the only way independent schools free from state inspection can be created is if the state provides no funds to the independent schools and the state does not provide so-called free schools in competition with the independent schools. Another way of saying this is: the state has been replaced by a non-coercive government, i. e., a Natural Republic based on Galambos technology. 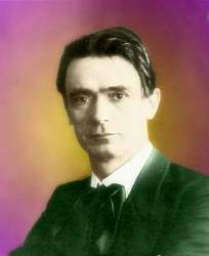 Once more we can see the alignment of the thoughts of Rudolf Steiner and Andrew Galambos, this time in the area of education in primary and secondary schools. Steiner reckons that his Threefold Social Order requires independence, but he lacks the technology in his time to make it possible. Let's read some more about what his requirements for the Threefold Social Order. [page 206] The purpose of the Threefold Social Order is to see that each of these areas of life becomes independent. Therefore, it wants to base everything on an appropriate healthy foundation. Everything that until now formed a disorganized, chaotic whole — in other words, the economy, the culture, and the state — should each become independent: an independent culture, an independent, democratic state, and an independent social economy. Human beings thus become the unifying element of those three aspects. People participate in all three areas, so we need not fear the loss of unity. We can see clearly in this description that the idea of an independent, democratic state is unrealistic — it has never existed for very long in the history of the world. As soon as the state is empowered, it eventually collects all the other areas of culture and economy under its broad wings of coercion and claims that this is a requirement for the good of the people. To the extent that in pioneer days, Americans could move further West as soon as the coercive bureaucrats moved in, freedom and independence still existed on a temporary basis. If we remove the state requirement and replace it with a Natural Republic which is necessarily independent of the economy and the cultural aspects of society, the possibility opens for Steiner's Threefold Social Order to be realized. The government of the Natural Republic would be independent and democratic in the true sense of the word, where the supreme power is held by the people of the country. That power will be exercised every time an individual makes a volitional choice for the protection of his or her property. Without coercion, the three social orders will be at all times independent and there will be no state to inspect the schools, no state to regulate the economy, and no state to promote or discourage aspects of culture. The votes in all three areas will be made by the democratic voters who will choose for themselves the options they wish for economic matters, cultural matters, and protection of their property. [page 206, 207] Some people believe that the threefold social order we are working toward would, so to speak, split a horse into three parts. They don't have the right picture of our goal. We are not trying to divide the horse into three parts; we simply want people to stop saying that a horse is real only when standing on one leg. [page 213] We don't need to fear the worldview of another if we are enthusiastic and strong in our own. Such attitudes can develop in free spiritual competition, but certainly not through laws. [page 214] Someone said that the state is necessary or that we could replace it with some sort of cultural senate or some such thing. What I actually said was that those who have not felt the compulsion of the state have not actually experienced it. You see, the reality is that it is now second nature for people to want to be teachers employed by the state. When that has become second nature, you are no longer aware that it is not really your free and independent self who teaches from the source of culture. Instead, you have become accustomed to the state and to presenting what the state offers for instruction. You think you are free; but that feeling of freedom, especially the way people now feel, is certainly no proof that you really are free. [page 216] In an independent culture we can certainly conceive of a constitution that isn't based on rigid laws and petrified governmental rulings, but one based rather on real, living relationships among those who participate in it. We must, of course, first replace "the law" with free, personal, and flexible human relationships that are, therefore, not bound by rigid laws, carved in stone for eternity. [page 218] We cannot simply attempt small changes in various institutions. What we need is a genuine rethinking, a transformation in our feeling, and fresh learning. Only in that way can we understand our time and really progress!